We are pleased to bring 37th DVA logo wear to you and thank those involved in making this happen. Along with making the association more identifiable, your purchase will help generate funds allowing the 37th DVA to continue operating. Every item displays the 37th ID patch in red and white with the words “37th Division” above the patch and “Veterans Association” under it. The clothing is a 50/50 cotton/polly blend on navy colored Jerzees brand clothing. The golf shirt and jacket are embroidered and the remaining clothing items are screen-printed. 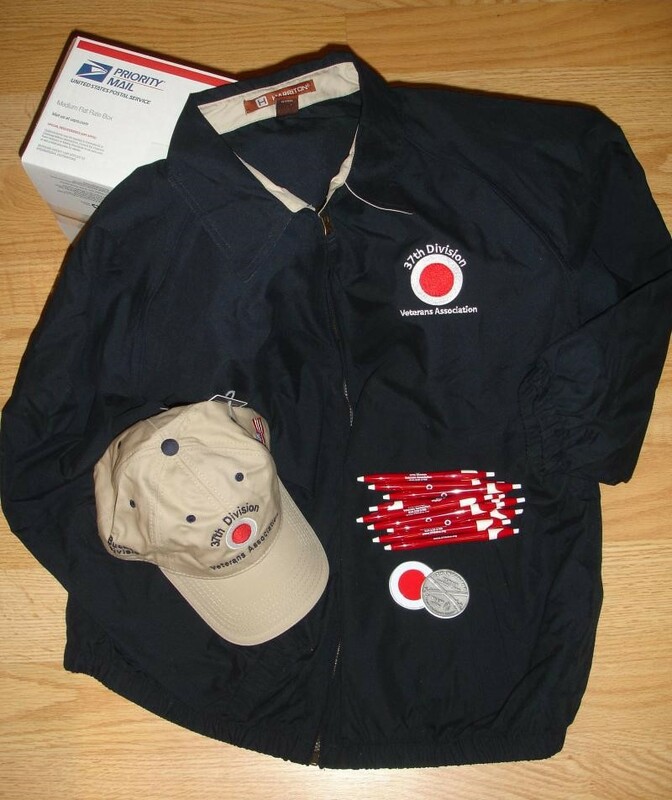 The jacket is Harriton brand, 100% polyester & washable. The 37th DVA cap is tan with the logo detailed above embroidered on it. A flag is embroidered on the right side of the bill and the words “Buckeye Division” are embroidered on the left when viewing the hat from the front. New Arrival: The 37th DVA logo pen, shown above, features the 37th ID patch, the association’s name, phone number & website address. The ink color is back. A reprint copy of Stanley Frankel’s The 37th Infantry Division in WWII is also in stock for those interested. This 397-page book details the division in the war and is written by a member of the 148th Infantry that served during the war. The book is a soft bound reprint of the original. It includes maps and many other supporting documents and is considered by many to be the best resource on the division during the war.